Cost: Small plates or starters range from £3.90 to £8.50. Main courses cost from £8.00 to £14.50. Desserts are from £4.00 to £6.50. About: The latest venture of Alan Yau (founder of Wagamama, Hakkasan, Yauatcha and Busaba Eat Thai among many other restaurants) in collaboration with Thai food expert David Thompson, Naamyaa Cafe has a range of dishes from Southeast Asia, including Thailand, Malaysia and Burma. It is named after Naamyaa, a one-plate Burmese meal consisting of fermented rice noodles with a shared curry sauce, and a variety of fresh, fragrant, spicy, crunchy and pickled condiments. Perhaps oddly, Naamyaa also serves some western favourites such as burgers and chips, Caesar and Niçoise salads. The restaurant occupies the ground floor of a bland, brand-new office block more or less opposite Angel station, but the interior has the beautiful stylistic touches we have come to expect from Yau - rows of golden Buddhas, an open-plan kitchen with rows of bottles and glasses lit up like chandeliers, chefs with flaming woks, and a wall tiled in pink Buddhist temples on a white background. Naamyaa has had some fairly mixed reviews, and I think it is the highly packaged formula that puts some Londoners off. It already feels like a chain although so far there is only one. What we ate: We opted for a range of Asian dishes, starting off with Changmama's panfried turnip cake, Chinese chive and bean sprouts (£5.50), and jasmine tea smoked baby back pork ribs (£8.50). The turnip cake was good with a lovely charred-flavour from the searingly hot wok, the pork ribs had tender and delicious meet that fell off the bone - both excellent. We also had the green papaya salad, with green bean, cherry vine tomato, birds eye chilli, dried shrimp and peanut (£8.50). This was surprisingly authentic, and better than many we had eaten a few weeks earlier in Thailand and with just the right amount of heat. The braised tofu, aubergine and shimeji (£9.40) was very good tasting both earthy and wholesome, I was very pleased to have ordered it. Mussaman beef curry, with potato, pineapple, peanuts and a dash of coconut cream (£11.50) was also well made, with flavoursome, tender beef and a richly concentrated broth. The portion was however minute. Pad Thai Gai (£9.10), had tender slices of chicken, noodles and beansprouts, it was well flavoured but a little more heat wouldn't have gone amiss. Morning glory, yellow bean, Thai garlic & red chilli (£5.80) was good and simply served, very much like I've eaten in Asia. What we drank: We shared a bottle of Petra Unger, Grüner Veltliner 2011, Austria (£30). 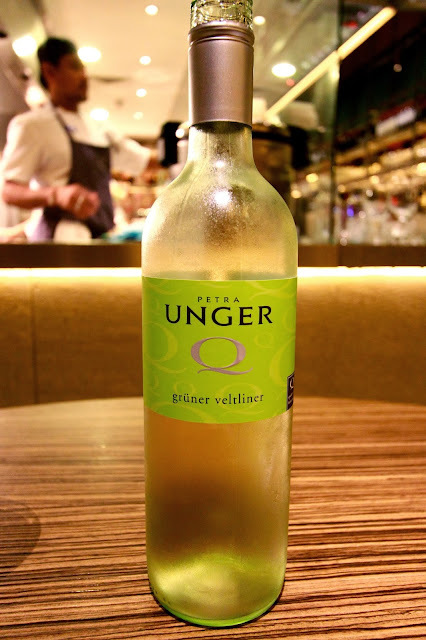 This had crisp fresh acidity, but little of the more complex mineral, citrus and peach flavours I look for in a Grüner Veltliner at this price range. This was a very disappointing choice. Most wines available on their menu are priced within the £20-30 bracket, with only one option below the £20 mark. Likes: A good central location in Islington. The jasmine tea smoked baby pack pork ribs and the braised tofu with aubergine and shimeji were great. Dislikes: The restaurant design and decor feel more like a chain-restaurant, and the proximity with Jamie's Kitchen (or it that Jamie's Italian?) next door does not help! Verdict: A good new local option for Islington, with some very good Southeast Asian dishes in a beautiful but informal setting, sadly in a rather soulless location. The combination of authentic Thai with burgers seems a little strange, and this lack of focus may go some way towards explaining why the restaurant does not seem yet to have been as much of a hit as Busaba Eat Thai. We went earlier this year, after twitter friends helped with an urgent plea for a recommendation in that area. We really enjoyed it, though did struggle with the chilli heat of one of the dishes, and that one was recommended by our waitress as on the milder side of the menu!